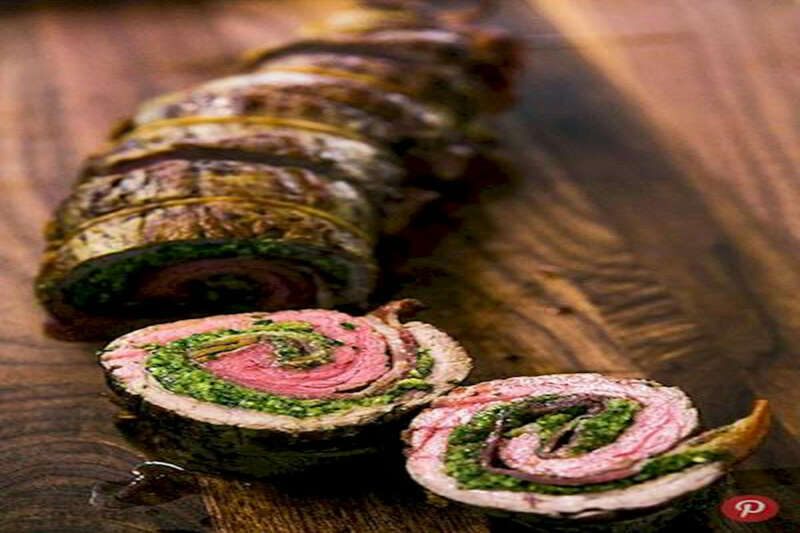 RecipeSavants.com This sophisticated roulade starts with quick beef steak that’s rolled around nutty pesto and bacon. This make-ahead meal is perfect for entertaining. Smart Recipes, European Recipes, Beef Recipes, Recipes Beef European Beef Roulades With Walnut Parsley Pesto PT1H Serves 6 Ingredients: 1 Lemon 0 To Taste Salt & Pepper 1 Cup Fresh Parsley 0.5 Cup Walnuts 0.25 Cup Pecorino Cheese 2 Garlic Cloves 0.25 Teaspoon Salt 0.25 Cup Olive Oil 0.5 Pound Thin Cut Bacon 1 Pound Flank Steak For the Pesto: Pulse together parsley, cheese, walnuts, garlic and salt in a processor until combined. While the motor is still running, slowly pour olive oil and pulse until combined. Set aside. For the Bacon: Heat a large pan and cook bacon over medium-low heat until just half cooked and limp not crisp or you won’t be able to wrap it inside the roulade. Remove on a paper towel and set aside. To Prepare Steak: Place steak between a heavy duty plastic wrap on a large wok surface and pound using flat surface of a meat mallet until it reaches 1/2 inch thickness or thinner. Flip every now and then to pound evenly. Now remove the wraps and pound with the pointy side of the millet for a minute or two. Trim the sides of the steak to make it rectangular or squarish. Season steak with salt and pepper. Preheat oven to 350 Degrees. Spread meat with a thin layer of pesto but leave about ½ an inch space on all sides. Place bacon on meat against the grain of the meat. Then roll up the meat tightly like you would roll a carpet. Trim any bacon extending beyond the roulade. Tie the roulade with 6 to 8 lengths of strings, about an inch apart each. Quickly brown the sides of roulade in the pan you used for bacon, you don’t want to cook the inside. Place the roulade seam side down, in a roasting pan on a rack. Roast for 20 to 25 minutes. Remove from oven and let rest for 10 minutes before slicing. Slice the roulade in-between the strings so each slice is wrapped in string. Serve with lemon wedges.